– Feedom Freedom was part of a collective effort to organize a free concert on Manistique this past Saturday the 13th. The event gave people a vision of neighborhood organizing and a belief in grassroots folks creating the beloved community. I witnessed musicians freely give their talents to assist and support the defense of Lela Whitfield in her fight against eviction foreclosure. The grassroots efforts were applauded and supported. At the height of the event there were 200 people in attendance. The musical talents ranged from hip- hop to classical with some bluegrass funk as well. Children played violins and a drum band marched in. One young mc performed his talent using language that he thought was what he needed to say to “make it” in the music business. One woman in the audience got upset and expressed her opposition. This was understandable but in our experience, anger ad walking away only reinforces separation between adults and youth. We talked with the young mc and asked him to think about intentional messages of inclusion for everyone in the audience. We asked him to think about the impact of his words. We are trying to find ways to offer loving guidance to our youth by supporting their courage to stand in front of a crowd and perform. At the same time, we want to help young people think about other people and their receiving our messages. The crowd was a mix of every age, ethnicity and faith. How do we include all while still being true to our message? I along with many of the artist shared the message of being visionary while resisting. Lela Whitfield should remain in her home that her mother left for her. She should be able to leave this to her son and granddaughter. Tom Barrow, a man I voted for every time he ran for public office, was in attendance and expressed the need for neighborhood organizing! The Pastor or the neighborhood church gave support and expressed gratitude for community coming together. 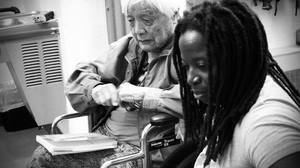 Children played and mingled with elders in a safe, productive environment. We shared food, music, laughter and hope. We look forward to follow up events and want all supporters for Lela to go to the Detroit Eviction Defense web site to see how they can provide assistance to keep Lela in her home. Collectively we can create the neighborhoods we want to live. A collective and responsible vision is in direct contradiction to individualism and materialism. Many folks do not have income or jobs and are relying on one another. It feels good to have neighbors and friends that support one another during difficult times. Feedom Freedom Growers is an urban garden that services the members of our community with cooking demonstration, art for children and early childhood garden learn & play programs as well as hosting youth led roundtable discussion. For more info about how you can become connected contact me, Myrtle Thompson-Curtis at 313 632 0991 or visit the Boggs Center Web Site. it is all a racket . . .
it is all a racket! is there any reason at all to hope? not to rise up and speak and organize! Over the last year, Zak Rosen and Andrea Claire Maio have been following students and educators at the James and Grace Lee Boggs School. Maio and Rosen have done pieces in the series about control in the classroom, two young students at the Boggs School who are best friends, and about making school more human. For the series’ last piece, Maio focused on the Principal of the Boggs School, Julia Putnam — a cornerstone of the school. Putnam met Grace Lee Boggs, the school’s namesake, when Putnam was 16 years old. “I know how skeptical Grace has been about starting a school, and whether or not that was the most revolutionary or the most strategic thing to do in terms of creating real change,” Putnam said. Read, listen, and watch more stories from the Boggs School series here.